In March, the Roundwood team gained an invaluable addition with the arrival of Ted. Ted is a friend of mine from Canada, who possesses a set of skills that have knitted seamlessly into the workings of Roundwood. A chef with 25 years’ experience, an expert on health and safety, a man fond of systems and spread sheets and as it turns out, a damned fine singer. Upon his arrival, we hit the ground running into our busiest year to date. Slowly but surely, we have been expanding our menus, planting gardens, and improving our overall efficiency. We even have weekly meetings, just like grown-ups. But our unexpected mutual interest in singing songs has been the most interesting development. As it turns out our voices blend amazingly, into a delicious harmonic sauce. And so, the endless hours we spend cooped up in the kitchen are regularly interrupted with spontaneous musical interludes. At one of our weekly meetings, the topic of USP’s, unique selling points, for our business came up. What can we offer guests that is unique to the personalities running Roundwood? Ted offered the fact that, increasingly, elements of the plates that we serve come from our own gardens. A selling point indeed, but not unique to us. I mentioned our menagerie of animals that wander the grounds and welcome our guests. Again, lovely but not unique. Then Hannah piped up with a mad idea. Why not sing for the guests after dinner? Present it as a complimentary sixth course. Lots of restaurants offer multiple courses, but they are all made of food. I had never heard of a musical course before, so an after dinner song definitely ticked the “unique” box. Whether it would be a selling point remained to be seen. And so we started. That night after desert had been served, I slung my guitar over my shoulder and Ted and I entered a packed dining room to present our first “sixth course”, to a family celebrating their matriarch’s birthday. The standing ovation and request for another song which followed convinced us we were on to something. A few songs later we thanked our first audience and took our leave of the dining room, but not before infecting them all with the music bug. As we got stuck in to cleaning the kitchen, a full throated version of Leonard Cohen’s Hallelujah burst through the dining room door. And then another song… then another. Our forced musical intervention had changed their evening from a gathering to a celebration. We had uncovered a super-power. An hour later, as all of the staff sat around a long-cleaned kitchen, it became clear that I would have to end what we had started, so the dining room could be cleaned. 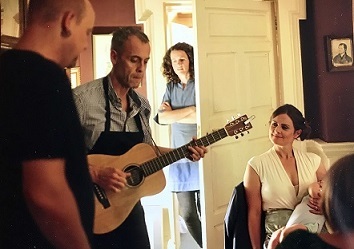 I grabbed my guitar and we started into an Everly Brothers number leading the celebrants, pied piper style, to the drawing room where the music continued for the rest of the night. The next morning over breakfast, the compliments on the night’s entertainment were enough to convince us that the “Sixth Course” would become a mainstay on our nightly menu. When one of the guests pulled Hannah aside to immediately book her 60th birthday, on condition of a repeat performance by Ted and I, we realised that our “unique selling point” had delivered.